2 ears of fresh sweet corn kernels sliced off the cob (may substitute 1 can canned corn drained). Pre-heat Oven to 375 degrees and also put a large cast iron skillet on the stovetop over medium low heat. Add the ham to the cast iron and cook until the edges begin to brown. Add the onions, peppers, corn and garlic. Sweat until the corn, onions and peppers are soft. Set aside to cool. In a microwave safe bowl microwave the sugar, maple syrup and vegetable oil on high for one minute until smooth when mixed. Combine All-purpose flour with cornmeal, baking powder, salt, ground pepper, cumin, cayenne, cheese, milk, egg and the cooked filling in a large mixing bowl. Combine the two and mix with a wooden spoon until just combined. Pour in a greased and pre-heated 10-inch cast iron skillet or greased 12 count muffin pan. Bake in pre-heated oven for 20 minutes for muffins and 30 minutes for iron skillet. Heat 2 cups of white wine or grape juice to just a boil. Add all the dried fruit and let sit for at least a half hour. After the fruit has doubled in size, drain off half the liquid. Return to medium low heat and bring to a simmer stirring every 2 min. Continue to cook until the consistency of very thick jam, about 20 minutes. Adjust to desired sweetness with sugar. I like this recipe a lot, not only is it bright in flavor but also in color. It is easily sliced into a wedge for an entrée or served as an appetizer when using the muffin pan. 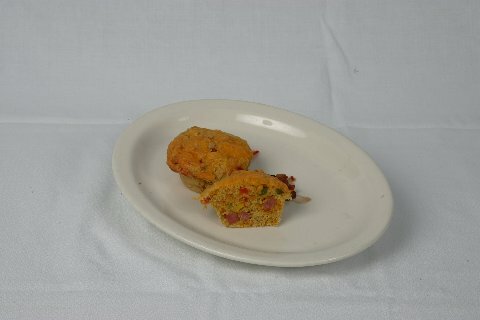 When both served warm the sweet tangy compote really marries with the cornbread. This recipe is simple to do and a great quick meal.